I discovered Free-moN last year and decided to build myself a module called the Alaskan Steamship Company. The module is named after the old warehouse that has operated in my fictitional area of Seattle since the 1900s. The old Alaskan Steamship warehouse and office building are located in China Town. I built the module over a period of three months last year. Free-moN is a modular standard for N scale railroading. 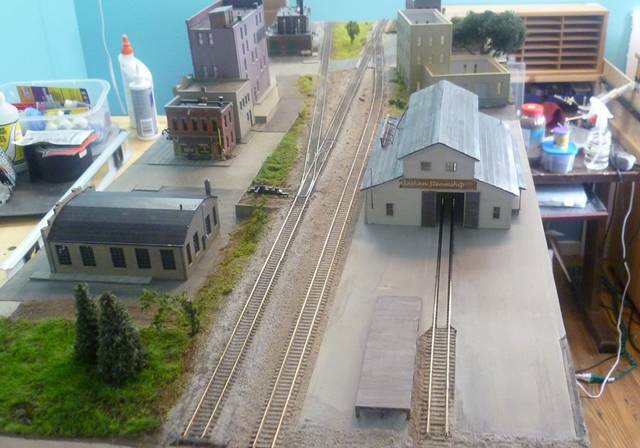 The purpose of the standard is to promote a more realistic model railroading experience. Some features include 50″ tall modules, code 55 track, and a lot of flexibility in the size and shape of your modules. My name is Greg Amer. I live in Kent, Washington. I’ve been model railroading for about five years. In addition to N-Trak railroading and my own HO scale layout, I’ve been loosely involved with a group of Northwest modelers around Free-moN for about a year. I know Portland is far (I live in Kent), don’t let that stop you. I’m interested in meeting more people locally too. I’d like to find more people with Free-moN modules to see if we could set up some ad-hoc layout meets around the King County area. The more the merrier, so we can reach a critical mass.